Here’s how we used the Mad Scientist methodology to win more than 12,000 new email subscribers for a nonprofit client in three months, doubling the size of their list. And the campaign is still going: more people are joining every day. Jesus Film Project (JFP) needed to grow a base of fresh new email subscribers. Like many established religious nonprofits, they were facing a new challenge: baby boomers make up their primary donor base, and younger generations aren’t aware of them. JFP wants to make inroads with younger people in the western world. Part of their strategy is to build a pan-generational audience around their mission (Christian discipleship), and to do that, they asked us to help grow an email list. In order for JFP to attract a workable audience quickly (without paying through the nose), they would need to produce content unlike anything offered by other nonprofits. We noticed that most established religious nonprofits tend to offer content squarely on the topic of their mission: most content is persuasive, describing the nonprofit’s mission and the import thereof. We saw that JFP had an opportunity to attract a large number of leads by broadening the type of content they offered. 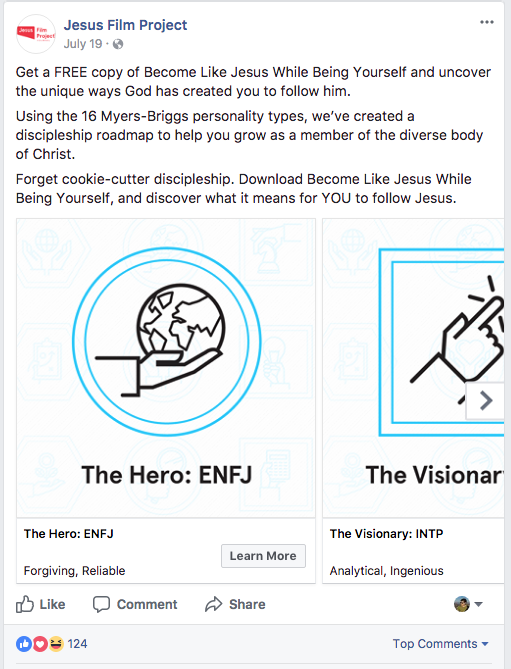 These ingredients became an ebook that let people read about their personality type in the context of Christian discipleship. It provided tips for becoming a better student or mentor based on your strengths and weaknesses. Jesus Film Project’s previous lead-gen campaign on Facebook had a CPL of right around $3.30. In comparison, the overall CPL for this campaign was just $0.24—a reduction of about 92%. They’re young: 77% of these new leads are under the age of 35(and 87% of them are under 45). They’re from the United States: 88% of these leads are from the USA, with the remainder primarily coming from the UK and Canada. They’re engaged: follow-up emails sent to this audience have an open rate of over 50% and a clickthrough rate of over 25%. It’s not just email subscribers, either—in addition to the new email subscribers, the ads resulted in 649 new likes on the JFP Facebook page. This campaign gives JFP a new audience they can tap when launching new programs, blog posts, and campaigns, and it’s not even finished. More people are finding out about JFP through this campaign every day. 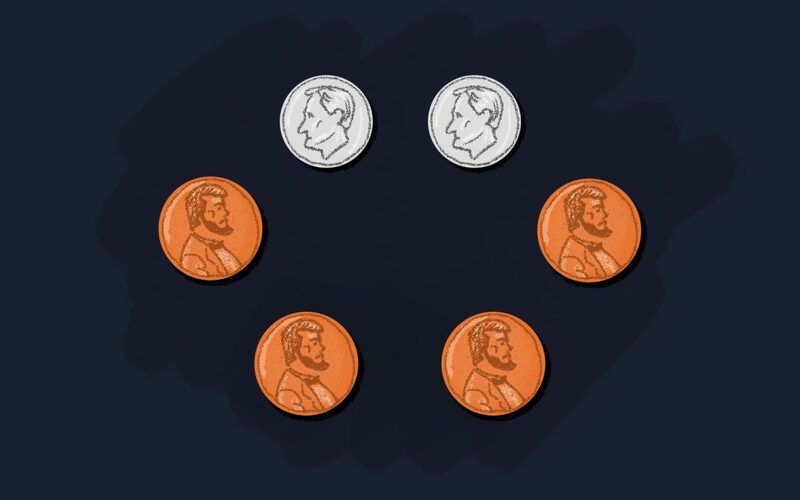 I probably don’t need to say it, but a 24-cent cost per lead is astounding. And while we haven’t cracked the code for consistently getting hot leads at a quarter apiece (yet), you can check out the nitty-gritty tour of what we did below. Here’s a breakdown of some of this campaign’s components—from the audiences we used to how well our landing page converted. Big, obvious disclaimer: no matter how closely you follow what we did, there’s no way to guarantee that you can replicate these results. Every audience, offer, and ad is a little different—and paid advertising on Facebook is notoriously fickle. While this isn’t a wash-rinse-repeat formula, there are a few tactical takeaways that you can use to drive your CPL down, too. I’m sharing this information to spark some ideas for you and let you in on some of the things we considered when we put together this campaign. We put together a handful of ad sets to test, spanning several different approaches to targeting. We tested multiple methods instead of just going with what had worked in the past—and it paid off, big time. We created an ad set based on JFP Facebook page likes—which turned out to be about 100,000 people after trimming down to certain countries and languages and excluding people already on the email list. This group is the low hanging fruit. These people had already decided to follow JFP at some point, and a sweet new resource could be just the nudge they needed to join the email list. Prior to this campaign, we installed the Facebook pixel on JFP’s website to begin collecting a retargeting audience. When we launched, that audience had grown to about 10,000 people. These people had already checked out JFP’s website, so it wasn’t a stretch to ask them to come back for more. We used Facebook’s interest targeting to find a group of people who were likely to be Christians interested in sharing their faith with others. This audience was based on general Christianity interests, then narrowed by also requiring another more-specific interest like evangelism or Bible study. Finally, we created a lookalike audience based on the existing Jesus Film Project email list. The list was made up of people captured through previous lead-gen campaigns and the JFP website, so we were confident it made a good source for this lookalike audience. Facebook compared the list to their massive data stores and found the 1% of Americans most similar to them. Across the board, we applied some general targeting rules: we limited our audience to English-speaking people from a handful of countries (primarily US, CAN, UK, AUS), and excluded people who were either already on the email list, had already liked the JFP Facebook page, or had certain Facebook-defined interests (such as atheism!) that made them poor fits. We also built the campaigns to have as little overlap as possible, excluding people from but one ad set. These exclusions ensured that the people in our ad sets would be new to the JFP email list, and we wouldn’t pay to capture duplicate addresses. So, how did the audiences do? In previous JFP lead-gen campaigns, the “warm” audiences (people who had interacted with JFP’s posts, liked their page, or spent time on the site) outperformed interest-based and lookalike audiences dramatically, with costs per lead that were 25% lower or more. We expected a similar breakdown in this campaign. People are really excited about retargeting, and for good reason: it’s one of the most powerful targeting mechanisms you have at your disposal. But as our results showed in this campaign, it’s not a magic bullet. Just because you can (and should) include retargeting in your advertising plan, doesn’t mean it’ll be the top performer. It’s still worth it to continually test other targeting methods. In this specific campaign, our lead-gen resource held a strong general appeal that extended far beyond people who already knew about JFP. Previous lead-gen campaigns resonated with existing fans and people who were already familiar with JFP content. If you were bought into the Jesus Film Project mission, you were all about them. But these campaigns made less sense as entry points for new people. By making a resource with wide appeal—one that was out-of-the-ordinary in the Christian nonprofit space—we were able to capture attention from people, even if they didn’t know us. This opened our targeting up to a much bigger group, and meant the campaign could last longer before running into frequency issues or slowing down. In our experience, Facebook’s conversion objective typically delivers a lower cost-per-lead than the website click objective. As you increase your budget, this becomes more true. The bigger your budget, the more data Facebook can gather to use for audience optimization. Just because someone clicks on your ad doesn’t necessarily mean they’ll become a lead. By choosing a conversions objective, Facebook will optimize for the clicks that are more likely to matter. When people completed our form, we sent them to a thank you page, which prompted Facebook to count a conversion. Facebook kept track of the people who hit this page and used it to find more like them. We also limited placements to Facebook feeds. While other placements (including the audience network) can deliver a lower CPC or better CPM, that traffic is usually far less likely to convert. If you want your ads to perform the best they can, it’s not enough to just create something awesome. You have to test it. There are a few variables that can significantly change the effectiveness of your ad. By far and away, the biggest contributing factor to success we found was ad format. The carousel ad outperformed all others significantly. We used each card in the carousel to feature one of the personality types discussed in the ebook, along with an icon and name for that type—both pulled from the resource. Why’d it do so well? Well, it’s hard to know for sure. But people are really interested in learning about themselves. Presenting the ad in the carousel manner encouraged them to interact with the ad and work through the images until they found the card that corresponded to their personality type. On the other hand, a single image ad would either have to lose relevance by going more general, or only really land for one group. The carousel format also encouraged people to click through to the landing page to learn more by getting them invested in the process before they even hit the landing page. Finding creative ways to use the ad format with your resource is one of the most interesting parts of advertising, and a way for your ad to outshine others. In this case, personality types matched with carousel cards perfectly. Our landing page for this campaign performed extremely well: a 58% conversion rate. The product photos we used for the guide made it look like a physical resource. This displayed value and drew connections to something tangible for visitors. There’s only one thing to do on the page, and that’s sign up for the guide. Our targeting methods and placements meant that page visitors were less likely to be there on accident and more likely to be interested in getting the guide. There’s a big draw to the resource itself. After seeing the ad, people wanted to know what it said about them, and the landing page copy reinforced that desire. Originally, we planned to run the campaign for just two months. But it would’ve been foolish not to continue running it after getting these results. So after its scheduled run date, we turned it into an ongoing effort that consistently grows the JFP email list. It largely runs on autopilot, capturing nearly 4,000 new leads every month. Of course, we’re already thinking about ways to make it (and other) campaigns even better! Don’t be afraid to try new types of content and offers—you might not expect what resonates with your audience. It’s almost always worth it to try multiple ad types and targeting. The losing combination for one campaign might be the highest performer for another. Consider the entire journey from ad to landing page to resource to follow-up, and find ways to make it cohesive and fluid. You can use your offer to come up with ideas for ad creative! Once you find a campaign that performs well, don’t abandon it to try other things. Ideally, keep it going while testing other campaigns until you have an arsenal of ads working together to help your organization reach its goals. Interested in working together to build an audience through strategic content? Drop us a line and we’ll get in touch!